RADIESSE for Hands, is the first and only dermal filler approved by the FDA to correct volume loss in the hands and help reduce the prominence of tendons and veins for smooth, natural-looking results. 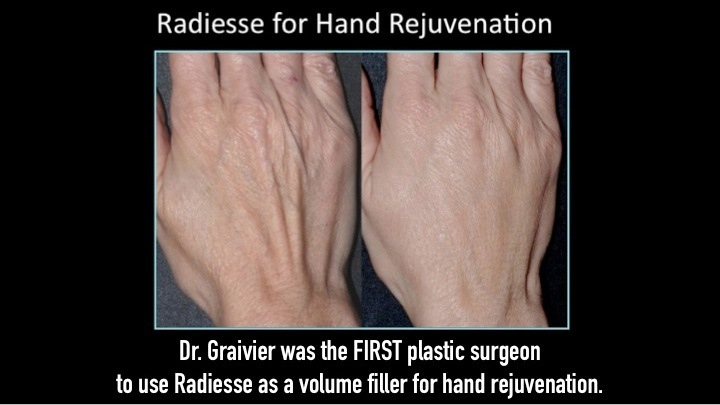 Dr. Graivier was the first plastic surgeon in the world to use RADIESSE for Hands rejuvenation! His expertise and knowledge will ensure quality results for our Atlanta-area patients. RADIESSE is a filler that has been approved for use as a facial filler for many years, but it’s use in treating hands is brand-new. Treating the hands with RADIESSE is a quick in office procedure that can usually be completed in 10 minutes. We’re offering this treatment for $2,500. Results will last 1-2 years. Contact us today to schedule your appointment: 770-772-0695.